Customer Experience online is a topic which many companies approach from a basic angle. Providing an online platform to allow customers to make purchases online is key to support the expectations of today’s customer. But the majority of businesses are approaching this with an in-the-box view which eliminates innovation, customer flexibility, CX personalisation and multi-channel visibility. As a result the customer feels neglected and perceives a negative experience. The online landscape allows customers a self-service approach to the buying cycle, something which still requires an element of customer experience to ensure transaction numbers and revenue objectives are achieved. Sales abandonment (aka shopping cart abandonment) is a challenge all online businesses are facing. Baymard Institute reported an average of 67% online sales are abandoned. Not only does this result in lost sales revenue, loss of loyalty and percept a negative customer experience, if businesses do not have an integrated system in place to effectively manage customer engagement & reap benefit from the customer data, this itself is a massive loss of opportunity. Businesses need to battle on and ensure they are up to speed with meeting the digital expectations of today’s customer. Not having an innovative digital engagement strategy will elevate the negative impact of sales abandonment and ultimately reduce sales revenue. 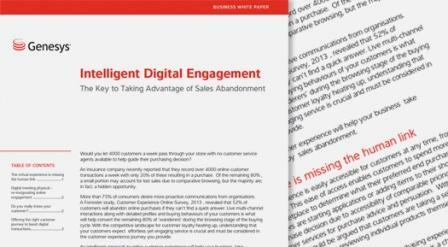 Genesys’s new whitepaper, ‘Intelligent Digital Engagement – The key to taking advantage of Sales Abandonment’, provides intriguing insight into the reality of sales abandonment and demonstrates how businesses can turn this negative into a real opportunity. Be the first to comment on "Intelligent Digital Engagement – The key to taking advantage of Sales Abandonment"